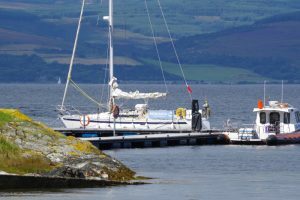 Our 40 foot research yacht on the pontoon at Lochranza. Towed hydrophone arrays are used by researchers in many parts of the world and operate from a wide variety of platforms, from small sailing boats to large oceanographic research vessels. The hydrophone system that we use is identical to those used during surveys of offshore renewables sites, including tidal sites in Orkney and Northern Ireland. Our hydrophone systems is essentially identical to the one used by the Hebridean Whale and Dolphin Trust, the University of Newcastle and the Fisheries and Aquatic Ecosystems section of the Agri-Food and Biosciences Institute in Northern Ireland. The Welsh and Scottish Governments originally funded and have been instrumental in the development of new Passive Acoustic Monitoring (PAM) methodologies for surveying tidal areas. 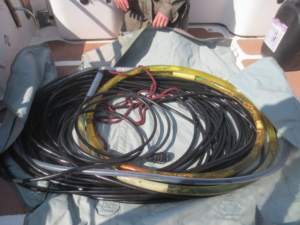 The standard towed array used for small cetacean survey consists of, in essence, two high frequency hydrophones with filtering preamplifiers and a depth sensor towed on a long strengthened cable. Hydrophones of this type were used on previous SCANS surveys and have been widely used for monitoring at renewable energy sites. The hydrophones and depth sensors are mounted in a streamlined oil-filled polyurethane tube steamer section. An oil filled tube is the standard solution of constructing a streamlined sensor sections adopted for both Naval and Seismic arrays. It also facilitates straight forward servicing and repair and the replacement or repositioning of sensors within the array if required at a later date. A stereo pair of hydrophones allows bearings to vocalising animals to be calculated from time of arrival difference using a real time data collection and analysis program such as Pamguard. 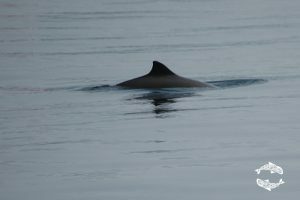 Using target motion analysis, Pamguard can localise harbour porpoises (and other cetaceans) from bearing patterns as a stereo hydrophone array is towed past them during surveys, and this provides data for the calculation of detection functions allowing quantitative survey analysis using Distance software. Providing an adequate ‘clean’ power supply for PAM systems running on small sailing vessels is always a challenge. The boat’s 12v supply often has limited capacity and is made ‘electrically’ noisy by other equipment on the vessel. The engines, in particular the alternators, are typically a strong source of electrical noise and on plastic boats engine rooms are not well shielded. There is occasions (demonstrating equipment on other vessels etc) when we move the equipment between vessels and requires minimum time spent setting up survey gear. We have a customised system that has very low power requirements, is small and self contained and for which all components, including the computer, run off 12v DC. Where electrical noise and independence are issues then the system is able to run off a large leisure battery for hours to days (estimated current consumption is 1.5 amps). In other situations an external AC power clean 12V supply can be used. Signal conditioning and digitisation is provided by a St Andrews Instrumentation Ltd DAQ card. This is mounted, along with power management, GPS, USB Hub and Measurement Computing DAQ for depth readout in a customised waterproof Pelican Case. Adjustable gain and signal conditioning for aural monitoring is provided by a small commercially available Behringer Yenyx 502 mixer. Data is analysed and captured using Pamguard software running on a 12v NUC computer. 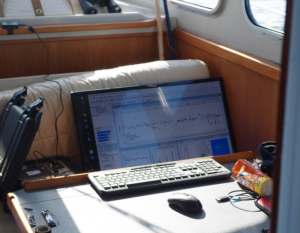 To reduce interference noise the Pamguard data is displayed on the vessels monitor using a WiDi connection and raw .wav files stored on a high volume hard drive for analysis back at the lab. Pamguard screenshot showing porpoise detections at the Calf of Man. This hardware system is designed to be 100% compatible with Pamguard, the industry standard open source freeware for acoustic monitoring. These hydrophones can also be used with other software application including the International Fund for Animal Welfare suite. We are then able to use Distance software or MATLAB to analyse the data sets and reach scientifically robust conclusions. Streamlined housing 5m, 3 cm diameter polyurethane tube. Filled with Isopar M hydrophone oil. Chappell, O., R. Leaper, and J. Gordon. 1996. Development and performance of an automated harbour porpoise click detector. Reports of the International Whaling Commission. 46:587-594. Gillespie, D. 1997. An acoustic survey for sperm whales in the southern ocean sanctuary conducted from RSV Aurora Australis. Report of the International Whaling Commission. 47:897-906. Gillespie, D., J. Gordon, R. McHugh, D. Mclaren, D.K. Mellinger, P. Redmond, A. Thode, P. Trinder, and D. X.Y. 2008. 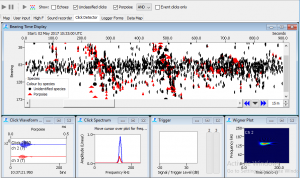 Pamguard: semiautomated, open source software for real-time acoustic detection and localisation of cetaceans. Proceedings of the Institute of Acoustics. 30. Gordon, J., D. Thompson, R. Leaper, D. Gillespie, C. Pierpoint, S. Calderan, J. Macauley, and T. Gordon. 2011. Assessment of Risk to Marine Mammals from Underwater Marine Renewable Devices in Welsh Waters. Phase 2 – Studies of Marine Mammals in Welsh Highly Tidal Waters. On Behalf of the Welsh Assembly Government. Doc. Ref. JER3688R100707JG. EcologicUK. 126. Hammond, P., and K. Macleod. 2003. SCANS II – estimating cetacean abundance in European Atlantic waters. Paper SC/55/SM22 presented to the Scientific Committee of International Whaling Commission.:5pp. Hammond, P.S., K. Macleod, P. Berggren, D.L. Borchers, L. Burt, A. Canadas, G. Desportes, G.P. Donovan, A. Gilles, D. Gillespie, J. Gordon, L. Hiby, I. Kuklik, R. Leaper, K. Lehnert, M. Leopold, P. Lovell, N. Oien, C.G.M. Paxton, V. Ridoux, E. Rogan, F. Samarra, M. Scheidat, M. Sequeira, U. Siebert, H. Skov, R. Swift, M.L. Tasker, J. Teilmann, O. Van Canneyt, and J.A. Vazquez. 2013. Cetacean abundance and distribution in European Atlantic shelf waters to inform conservation and management. Biological Conservation. 164:107-122. Leaper, R., and J. Gordon. 2012. Marine Mammal Acoustic and Visual Surveys – Analysis of Neart Na Gaoithe data. Appendix 13.5 Neart Na Gaoithe Environmental Statement. Mainstream Renewables. 20pp. MeyGen. 2011. MeyGen Tidal Energy Project Phase 1. Environmental Statement. Chapter 11 Marine Mammals. 41. SmartWind. 2012. Hornsea Offshore Wind Farm, Project One, Preliminary Environmental Information Report. Volume 2 – Offshore. Chapter 5: Marine Mammals. E. Ltd, editor. 96. Swift, R., S. Rankin, T. Gerrodette, B. Taylor, D. Gillespie, J. Gordon, L. Rojas-Bracho, and A. Jaramillo-Legorreta. 2011. Towed hydrophone surveys for monitoring trends in the abundance and distribution of the critically endangered Gulf of California porpoise, Vaquita. The Journal of the Acoustical Society of America. 130:2420.